April 23, 2011 by Alphageek in "alphageek", "cooking"
Recently, we purchased a charcoal grill for use here at AGTF. Lately, I have been interested in cooking outside a little more. 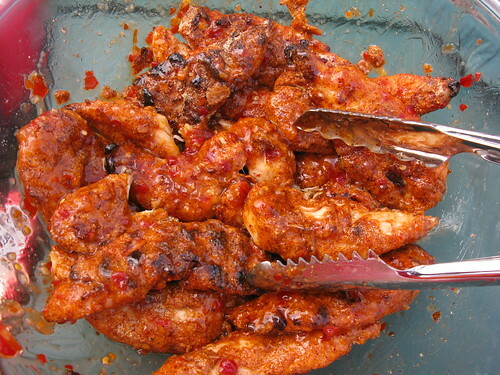 I thought it might be interesting to try to grill some chicken sort of buffalo wing style. Sure, I could just deep fry the chicken, but I wanted this to be an outside event, without all the fuss of the deep fryer. Besides, being the slim middle aged man that I am, I an trying not to eat too much fried stuff. My first attempt was easily described in one word: horrible. I simply grilled some chicken and poured the sauce on after the chicken was done. 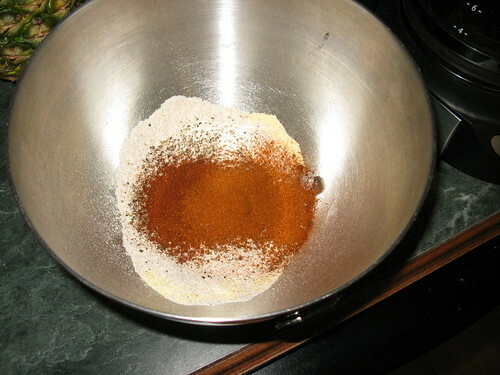 There were several problems that led to panning this method. The first is that the chicken cannot really hold or absorb any of the sauce. As a result, the sauce just sort of runs off instead of hanging around and contributing something. On the other hand, that might have been better because what sauce did stay was thin, and almost raw tasting because the sauce did not combine with the food. It simply laid there, tasting like it had been squeezed out of some sort of plastic package at a run of the mill fast food joint. I did a little poking around online, and figured out that one could take a simple technique and use the technique to vastly improve the experience of grilled buffalo chicken. First, the chicken needs something wet. 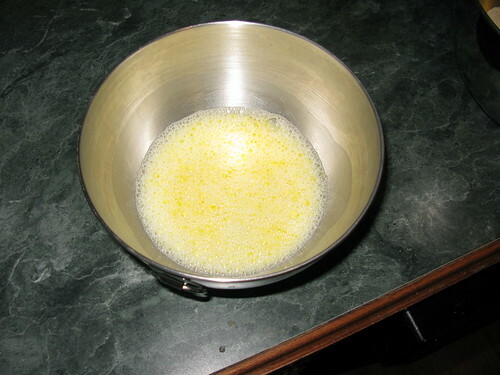 I used about a half cup of milk and one egg mixed together for the wet side. You are going to dip the chicken in this first. Then, you take the wet chicken and roll it around in some dry stuff and the wet stuff helps the dry stuff stick to the chicken. In this case, I used about 1/2 cup flour, 1/2 cup corn meal, salt, pepper, and some chili powder. You could change the spices considerably. That is the fun of cooking: YOU get to create. I thought chili powder would go well with the buffalo seasoning. I coated all of the chicken using the complicated, two step process: put chicken in the wet stuff and then the dry stuff. I then placed the chicken on the Weber Grill that I was wanting to try out. 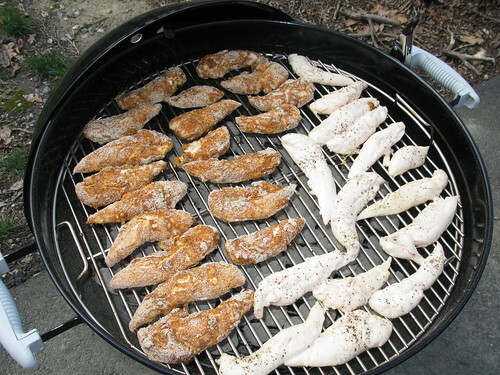 As you can see below, the coated chicken looks considerably different than the regular chicken that also occupies the grill on the right side. Yes, the chicken has some dry flour on it. 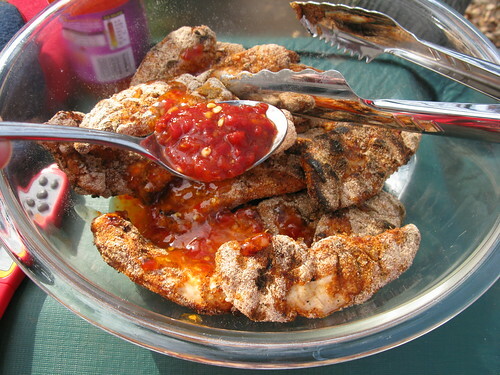 I used chicken breast tenders, which are not very fatty, so they leave a little dry flour on the chicken. Don't worry about that because we have a step coming up that will fix that problem. Okay, so now I take the chicken off once it gets to temperature. I like to use a meat thermometer so that I don't over cook the chicken. I took all of the coated and now grilled chicken and tossed it in a big bowl. I poured some of my favorite buffalo sauce over the chicken. The Alphageek happens to like Franks Sweet Chili Sauce, but almost any sauce would do. I decided the sauce needed a little boost, so added some ground chili sauce that you see on the spoon. The Alphageek likes spicy food, so you might want to skip this step but if you like hot food, pile more on! I simply mixed all of the ingredients together, to make the final dish that you see below. Remember how I said not to worry about the dry flour? You can't even tell anymore. You won't have as much dry flour if you use a fattier cut of chicken, like drumsticks or wings. You can cook pretty much any part of the chicken this way. Did I mention the flavor? Instead of runny, pathetic sauce, you now have delicious, sauce that sticks to the chicken, and provides great taste as the chicken goes down. This only takes a few minutes to do, but the difference in taste is simply amazing. The Alphageek was able to wow Mrs. Alphageek with this technique. You could wow your friends and family as well. Try different sauces, and remember you could use many different sauces on one batch of prepared chicken. Do you have any suggestions? Leave some feedback below. This will be the summer of grilling, so keep checking back for more information.